This past November I had an opportunity to check an item off of my “bucket-list” and it was, as hoped, SPECTACULAR! Accompanied by my boyfriend and former Bristlecone employee of the month, Dodge Cottle and two other friends, I completed my first self-support kayak trip through the Grand Canyon of the Colorado. Due to work-related time constraints, we decided to do our trip in 11 days and we also chose to pass Diamond Creek and paddle the entire length of the Grand, ending in Lake Mead and taking out at Pearce Ferry. Our trip spanned from November 21st through December 1st. Based on timing and mileage, we had to paddle around 27 miles each day which made for a different Grand Canyon trip than I had ever done. Oh, and I was carrying all of my own gear for the first time making my kayak much heavier then I was familiar with. This trip was rather gear intensive and all of the pieces were quite small. I paddled Jackson Kayak’s Karma RG and due to its smaller diameter of the storage hatch opening the size of every item that I brought was limited and I found that dividing all of my dry goods up between lots of small dry bags was the key to successful daily boat-packing. I used multiple small dry bags, the largest being 10-liters and 2 Sea to Summit eVent compression bags. While packing everything into my boat I would lay the Meadow Mat camp tarp that I brought along with the Jack’s Plastic Welding collapsible bucket in the bottom of the stern-hatch and would load all of my dry bags on top of these things which successfully kept my bags out of the water that collected inside of the hatch. In the bow of the boat, I used 2 Watershed Futa Stow-float bags that went into the bow, one on either side of the bulkhead. In order to avoid holding a bag on my lap each day, I also had a Sea to Summit Solution Access Deck Bag that I was able to attach directly onto the JK factory’s bow deck rigging making the attachment bomber and giving me great confidence of not losing the bag or its contents. The weather was mild but the water is always chilly down there so I was wearing a Patagonia Capilene Thermal Weight One-Piece Suit underneath my dry suit daily on the water and I had an additional suit that I lived in at camp too. Some other key warm clothing and gear that I had were Patagonia’s Nano Puff Pants, a warm and dry Heidi Hat and a silk-weight neck warmer for in camp and one that was easy to access while on the water, Poagies while on the river and Hydroskin Gloves to unpack and set up camp in. I also brought a Kelty Bestie Blanket that was definitely a luxury and took up valuable space, but I would bring it again in a heartbeat. It is an incredibly versatile item and I used it wrapped around my body every single night at camp and then spread it over the top of my sleeping bag at night for an extra layer of warmth and making it easily accessed for night-time pee trips. (I also used the collapsible bucket at night as a latrine so my time out in the cold was limited and so I didn’t have to get my feet wet each time). I used a Big Agnes sleep system including the Storm King 0 degree sleeping bag, the Insulated Air Core Ultra sleeping pad and the Synthetic Sleeping Bag Liner and I had a Sea to Summit Aeros Premium Inflatable Pillow that worked well inside of a cotton pillowcase. We slept inside a Marmot Tungsten 2p tent and had a Big Agnes Whetstone Shelter to double as a kitchen or additional covered space on standby to bring in case the forecast looked wet. (We decided to leave the shelter in the truck at the put in based on the mild forecast). Finally, my Hydroflask 16 oz Coffee Flask was a crucial piece of gear keeping my cherished daily chai warm until lunchtime each day. Dodge and I had decided that we would cook and plan meals together and that we wanted to eat as few commercial dehydrated meals as possible, sticking instead to easy and lightweight meals that were lower in sodium and high in nutrition. We had things including but not limited to; macaroni and cheese, summer sausages, quinoa, couscous, tortillas, nut-butters of all varieties, cheese, crackers, ramen, our own mix of dehydrated vegetables which we pre-mixed into the grains and sorted and bagged per each planned-meal. We ate a couple of Tasty-Bite Indian meals and this company also makes seasoned rice that we supplemented our Good to Go dehydrated meals with (we liked the Pad Thai and the Thai Curry best). We had also pre-made chili and a quinoa and bean salad that we ate on the first few days of the trip. The quinoa and bean salad lasted us through 3 lunches and we would dump it into a tortilla with a sheet of nori and would share a packet of mayonnaise and one of mustard too. Because of the cooler temperatures and the limited direct sunlight, we were able to keep food for longer than expected including fresh cheeses and sausages throughout all 11 days of the trip. We brought tons of snacks including nuts, peanut butter filled pretzels, chocolate bars, jerky, candy (but I could always use more candy! ), hot apple cider, hot chocolate, miso packets, chicken soup packets and we had dehydrated a bunch of fresh fruit on our own while it was in season and at its sweetest throughout the summer and fall. 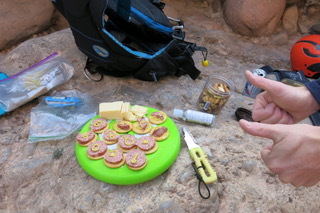 We ended up having brought too much food and could have lasted another 3, maybe 4 days on the river we figured. Some things that we brought that we didn’t eat; oatmeal, granola, tuna fish pouches, dehydrated milk, freeze-dried fruit and tea. At the end of the trip, due to removing all of the unnecessary trash and packaging prior to departure, Dodge and I had only 1 gallon-size zip lock bag of trash between the 2 of us. We also brought oil, butter and fresh garlic all stuffed into Nalgene Bottles and Jars along with a pretty complete and kickass spice kit which made every meal more enjoyable. Additionally, we raided the local grocery store’s deli, filling our pockets with individual packets of mustard, mayo, relish, salsa, hot sauce and ketchup which we added to almost every meal, in some capacity too. We had a Sea to Summit 2.8-liter collapsible pot and the 8” X-pan that we used with the MSR Wind-Pro II stove. Dodge also brought his Jet Boil stove for making our morning coffee and chai and that type of stove boiled water exponentially faster than the other cooking system that we had with us (we did dishes with hot water every night as well). We brought a Katadyn 6-liter gravity water filter and a 5-gallon collapsible bucket for settling water in. The gravity filter was completely awesome and worked really well and was easy to use too. We each had an MSR 6-liter dromedary and a 32-ounce Nalgene water bottle and Dodge also had a 2-liter MSR dromedary. Dodge and I filtered water every other day or so and we felt blessed to have clear-green water throughout the entirety of our trip making life overall much easier. We did bring alum powder for settling sediment in case the water was muddy and were lucky to never have to touch it! A Garmin inReach was borrowed from a friend and put our minds at ease while on the river and we also carried all of the safety and rescue equipment as required by the National Park Service including an NRS Comprehensive Medical Kit. We purchased a Coyote River Gear Breakdown Aluminum Firepan, which Dodge and I divided between the two of us to carry as well as a full-size fire blanket per the Grand Canyons rules and regulations. We only burned 2 fires using driftwood we had found and carried all of the ash out in the plastic containers that we brought our nuts and peanut butter filled pretzels in and after we had eaten them. · A Helinox Chair Zero and Camp One Table. I was not willing to spend my camp time sitting on the ground and this set was compact and lightweight and absolutely perfect. · Tarps. I brought a tarp, plus a standing mat as well as a cockpit cover which I found to be crucial for keeping my gear, dry bags and myself out of the sand. I would pack my tarp and cockpit cover in my boat last so that they would be the first things that I would pull out of my boat and then would unload all of my dry bags onto them. We also used a tarp for our kitchen and did all of our food preparation and cooking there, which minimized the sand consumption considerably. · Tenacious Tape was the most used item in our repair kit – definitely bring some. · Lights! Big Agnes MtnGLO tent lights, ENO Twighlights LED string lights, and Black Diamond Moji Lanterns lit up our camps (and lives) nightly. Dodge and I spoke at length before the trip about every single item of gear that we brought, really overthinking the whole process (so we thought). After the trip we have talked about how every single item that we brought was completely perfect! Every ounce of gear was well-made and served exactly the purpose it was advertised to serve. Our dry bags stayed dry, despite large amounts of water getting into our boats. The Hydroflasks stayed warm (hot), the Helinox chairs and table were ideal and sturdy, yet light and small. The Big Agnes sleep system was amazing and I loved not slipping round all over the place on my pad… The Patagonia gear was all perfectly warm and dry and if it got wet, dried out over the chilly nights, outside!! The thought and planning really paid off as were would bring every single item again on our next trip! This was an exceptionally special and unique way to travel through the Grand Canyon of the Colorado and I would jump at the opportunity to do it all again. It definitely took a couple of days to become familiar with the packing process and it was always a process because every single item had its very specific spot inside the boat, but I became faster and more efficient as time went on. In hindsight, I believe that the “ideal” way to do a Grand Canyon trip of this kind would be to take more like 13 or 14 days total and to take out at Diamond Creek. I figure that this timing would provide more ample time for exploration and side canyon hikes. Due to the fact that we had to make around 27 miles per day we were left with limited time to spend in the classic side canyons and we were unable to make some of the hikes and stops that had been deemed “necessary” on past trips. I will be back, I am certain of this, and I hope that it will be as a self-support kayaker because nothing compares to the self-satisfaction that comes from getting myself and all of my equipment through 280 miles of the breathtaking, challenging and iconic Grand Canyon. 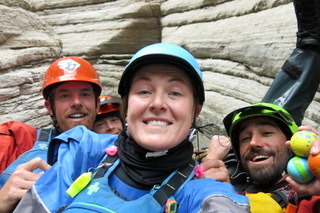 Ali Wade was born and raised in Carbondale, CO and began kayaking at age 11. She attended Colorado Rocky Mountain School (CRMS) and joined their competitive kayaking team which eventually led her to multiple World Championship competitions, winning 1st, 2nd, and 3rd places in consecutive years. After competing internationally in kayaking for a handful of years, she worked as a ski patroller at Aspen Mountain for 9 seasons with her avalanche search and rescue dog, Jane. She now gets out on the river as often as possible while working as an adventure nanny and preschool teacher at an outdoor-based school in Carbondale for young rippers!